Morning classes at DCS will be running two hours late due to icy road conditions in the area. Both Middle School and Elementary School morning classes will start at 10 am. Afternoon enrichment classes will run as usual with no change in scheduling. Well, it’s finally ready – the Fall, 2017 Enrichment Class Schedule is here! We have some very interesting offerings this term – many of which are continuing from last school year, plus several new ones. We hope that there is something for everyone in the mix! We tried to achieve a balance of classes with some PE, science, technology, math, language arts, visual arts and performing arts options for varying age groups. Believe me, figuring out the availability of instructors on certain days and times, combined with the age limits, space, and budget constraints and trying to have a well-balanced offering of classes on different topics is a lot like one of those logic puzzles we all did as kids: “Johnny has a hamster and likes chocolate cake. Susie lives in Seattle and has a green car. Who was born in August?” It was very tricky! But thanks to Miranda’s foresight and help back in May and June, the input and suggestions from staff and parents, the new space we were able to rent, and a lot of excellent new enrichment educators (and their flexibility), we think we have a pretty good selection of enrichment classes for our students this year. We tried hard to get at least one enrichment class for each grade level during each afternoon time slot. Because we are also renting the extra building in downtown Dallas for this school year (located at 140 SW Clay St, Dallas, OR), we were also able to offer a third class during many of the time slots (some “off campus” at the other building, as we don’t have space for a third class in our current DCS building). That building is a short, eight-block walk, ride or drive away through a quiet, residential neighborhood. As per our Parent Handbook, parents are responsible for transporting children (or allowing them to walk, bike or carpool) to other enrichment class locations, even our North Campus Building. Enrichment Class Enrollment: Because of our space and staffing limits, we are unable to accommodate every student who wants to take every enrichment class. In order to make it more fair, we ask that each family communicate the top three enrichment class choices of each of their children to their Guide by the end of the day on Friday, September 1. Guides will be starting back to school and contacting their families this week (Aug. 28-Sept. 1). By September 6, we will have made sure that each student gets a spot in at least one of their top three enrichment classes and inform parents of the confirmed registrations. On Thursday, September 7, we will open up enrollment for all remaining spots in the enrichment classes for online enrollment via Course Storm. At that time, families can technically enroll a student in as many Enrichment Classes as they want as long as spots are still available. On September 8, we will send out a reminder email to let families know which classes still have spots available, to encourage full enrollment in every enrichment class. By September 11, Enrichment Class lists will be closed and finalized, and registration confirmation will be sent out to families and instructors. Enrichment classes will begin two weeks later, the week of September 25. See our Enrichment Class FAQs page for more detailed answers to some other frequently asked questions about Enrichment Classes. We spent quite a bit of time this summer analyzing the results and feedback from the latest DCS Parent Survey from the end of last school year. One trend was that parents (and students) wanted more appropriately divided age groupings for certain classes, so that younger students did not feel overshadowed by older students, while older students could delve more deeply into some topics without the instructor feeling like they were going too fast for the younger students. In other words, parents want a depth of subject exploration appropriate to students’ level of understanding and ability. To this end, we still have a good mix of ages in our class offerings, with a few K-8 or 1-8 classes on offer, but we also have a lot more classes for younger OR older age groups. Flexibility was another key word from the last parent survey. DCS parents consistently said that one of the best things about DCS was our flexibility. And in fact, it’s even in our mission statement: “Dallas Community School is an inclusive public charter school supporting collaborative, standards-based education in a flexible, non-traditional environment.” And we ARE flexible – for example, the age / grade guidelines for each enrichment class are still flexible. If you have a precocious second grade student who would love to learn about Ancient Egypt (listed as being for grades 3-6) or a 4th grader who would like to be with a younger sibling in a class listed for grades 1-3, you can let us know of this preference. However, we leave the ultimate decision (and criteria for deciding) up to the enrichment educators themselves, who know the class materials and teaching styles better than we do. Please keep in mind the other parts of the DCS mission statement relating to our enrichment program: Non-traditional, collaborative, standards based, and inclusive. “Non-traditional” in that we do not offer full-day classes like traditional public schools and are able to offer a wider range of innovative and interesting enrichment classes and opportunities to spark students’ interest and curiosity. “Collaborative” in that we work together with various educators including homeschooling parents, of course, to make connections between many different aspects of students’ learning experiences, at home, in morning core classes, in enrichment classes at DCS, on field trips, and in other learning experiences in the wider community. We don’t expect (nor would we be able to accommodate) children to enroll in an enrichment class every period and stay in our school all day as they would in a traditional public school, but we do expect (and hope) to collaborate with you (parents), and with each other (community educators and DCS staff) to provide the best possible learning experiences for your children. In keeping with our strength in flexibility, please let us know if you have any special challenges or need special considerations in scheduling your children’s afternoon enrichment classes and we will try our best to help. This year, in our theme of collaboration and community, every enrichment educator enthusiastically accepted our suggestion to include parents more in the enrichment classes with their own child(ren) as learners / participants (and a little bit as helpers…). This is exceptional because many schools do NOT encourage regular parental involvement. Teachers or administrators might cite examples of parents chatting or being disruptive in a class, taking discipline into their own hands despite the presence of the instructor, or being “too engaged” with their own child, to the detriment of the rest of the class. However, there is a lot of research showing that the involvement of parents in their own children’s education has a huge influence in the children’s achievement. As homeschooling families, you already know all about this, and we do too. Which is why we are so excited about being able to encourage parents to attend enrichment classes on a regular or semi-regular basis. Please see the Enrichment FAQ page of our website for more information about parents attending and helping in our Enrichment Classes. Finally, we appreciate your input and feedback, both from the official parent survey(s) and polls and from your in-person and email communications. We appreciate hearing what students and parents think of the classes, instructors, materials and facilities. We try very hard to take it all into account as much as possible (again, within our budget, personnel, space, and time constraints). However, when you have questions, feedback or issues with the school, please contact us directly by phone or email at school and not through social media (like the DCS Facebook page). You are guaranteed a more prompt and productive response, and we would prefer to have respectful, honest, direct, and accurate exchanges of information than indirect and possibly accidentally inaccurate or misleading information exchanged on Facebook. And, without further ado, here is the list of enrichment classes for you to peruse for Fall term, 2017. We think it’s a great selection this term, and we thank you all for your understanding of the challenges in offering enrichment classes to such a wide range of ages, abilities, and educational backgrounds. Please have your child(re)’s top three enrichment class choices ready to communicate to your Guide when you speak with her this week (before the end of the day on September 1)! 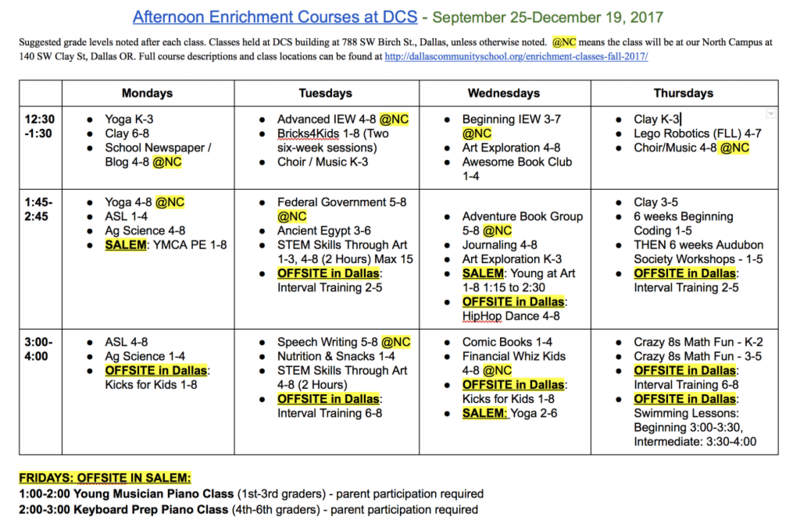 Meanwhile, don’t hesitate to let us know if you have suggestions and preferences for future enrichment class offerings, or if you know other community educators who would like to teach enrichment classes at DCS. We look forward to making our flexible, non-traditional and collaborative educational environment as rich as possible for all of our families! Welcome to the 2017-2018 school year! I hope all of our DCS families have enjoyed a summer vacation filled with fun and exciting memories of your loved ones. We are thrilled to welcome all of you back to a new school year of learning and growing. We have been busy planning and developing our program; the 2017-2018 school year at DCS is going to be awesome! All signs point to another incredible and productive school year. Our skilled and devoted staff is already planning and preparing for your child(ren). Our enthusiastic office team is registering new families, ordering needed curriculum and instructional materials and updating student files. We are indeed a joyous and caring community with the common goals of nurturing responsible, caring students and promoting high-level learning. Personally, I am grateful and elated to continue this journey with you as your Director. Over the past year, I have learned a great deal about the needs of home school families and how best to provide support to you as the primary teacher for your children. We believe that every person in the “DCS Family” should be growing and learning. This year parents will have opportunities to become more involved by participating in trainings, enrichment classes, and group discussions about teaching and learning. I look forward to continuing to build a strong relationship with all of you in the upcoming year. We look forward to seeing our new and returning families this fall. We can’t wait to provide new classes, field trips, Friday workshops and other exciting improvements. 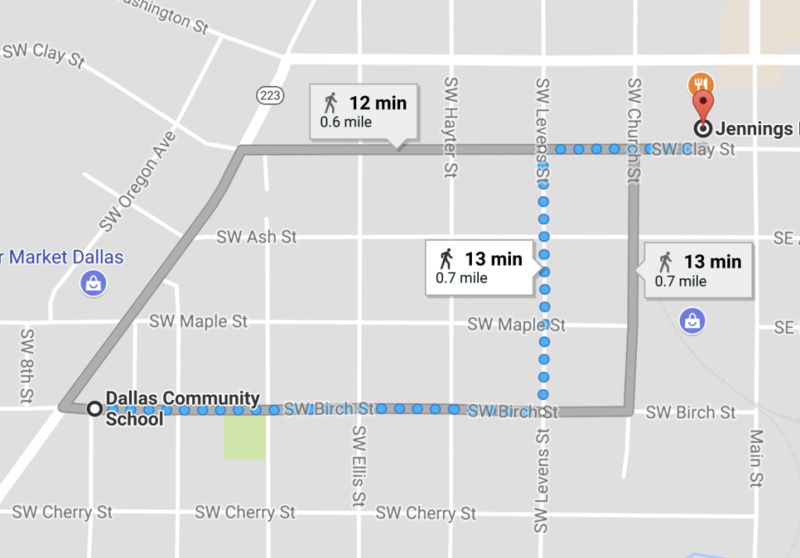 We are working to update our website http://dallascommunityschool.org/ with more current, user-friendly information. In the near future, you will find all of our calendars, class schedules, fieldtrip, and other helpful information at this site. 2017-2018 is going to be a great year at DCS. If you have questions related to the school schedule, policies and procedures, etc. please feel free to contact me at the school, (503) 420-4630. We have renewed our annual subscription to Britannica School and added Britannica Science for middle school. To access, go under the student portal and follow the instructions on the Britannica School page. The three water outlets within the DCS site were sampled on Wednesday, August 24th and the results were delivered to Water Lab Corporation in Salem. We received the test results on Monday, September 19th and are reporting the findings. All fixtures reported No Detection (ND) at the Method Reporting Limit (MRL) of .001 mg/l. The EPA limit is .020 mg/l. As a matter of safety, should the results have had the presence of lead, DCS provided a water dispenser for student use through Sierra Springs. We will continue to make water available through the dispenser, but you now know that DCS water is safe to drink. If you would like to see a copy of the results please contact the school office at 503-420-4360.